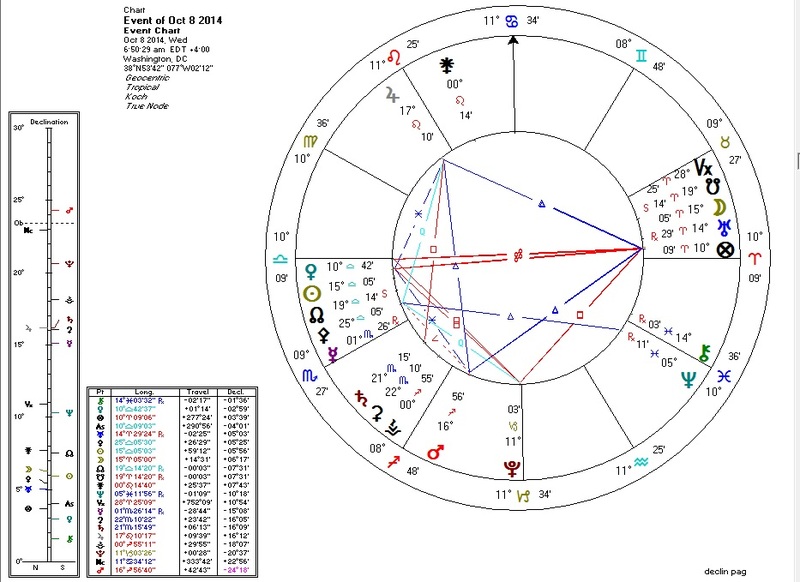 An astrological discussion I attended two weeks ago came to the chart of the past October 8 2014 eclipse (then in the future), set for Washington DC. The chart has an ominous placement of Pluto at the IC -- a portent of something serious for the nation and potentially deadly. Participants predicted new events regarding terrorism or increased warfare. I said: "Ebola outbreak". Why? First, the effects of the eclipse were apparently manifesting long before the peak. Note the price of Bitcoin which was to hit bottom almost exactly during the eclipse itself: the price had been failing for weeks before. It seemed reasonable that whatever the manifestation for the US would be, there already would have been prior warning of the possibility. Ebola was already in the news. Second, Pluto at the IC does in fact suggest death... but I saw the Pallas/Sun/Mercury/North-Node stellium and ruled out mass violence. Death, but no violence: this suggests a natural disaster or other "act of God". Third, Chiron and Neptune at the Sixth House cusp, suggesting problems and confusion regarding health and/or the general population. Fourth, the Moon (representing perhaps "the people") in the Seventh House (of "others") conjunct Uranus ("the stranger") and the South Node (loss/disease and possibly also representing a foreign element). The Moon here rules the Tenth House, suggesting that chaos and loss also affect the State. Obviously, I should have blogged about it then. Eclipses can be associated with confusion. Note this sampling of articles from the mainstream and alt-media positing radically different ideas about the US outbreak, ranging from taking it at face value all the way to "it's another manufactured false flag event to create panic". I don't claim to know: certainly real epidemics occur, but our own state/media apparatus has made it a regular activity to incite panic about some new disease (remember swine flu, etc.?) which ends up selling lots of vaccine shots but not becoming a serious public hazard.